Combining yesterday’s provisional GCSE results with data from the School Cuts website reveals that it is England’s lowest performing schools that are facing the biggest drops in per-pupil funding. 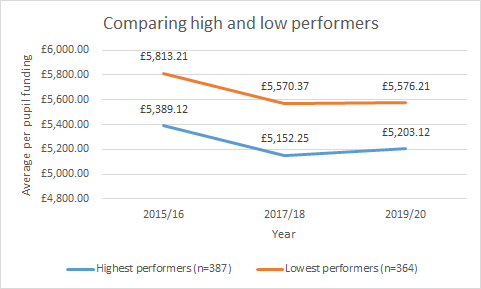 The secondary schools who performed least well according to yesterday’s data are losing an average of £237 per pupil (a 4.1% drop in per pupil funding) whilst the highest performing are losing £186 per pupil (a 3.5% drop). 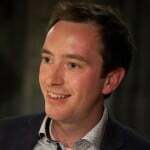 This means the 364 schools in our analysis who most struggled to secure good progress in this summer’s exams are facing an average drop in funding of over £170,000. Comparing figures from year to year shows that the largest drop took place between 2015/16 and 2017/18. …these calculations are in absolute terms and do not take into account the additional costs – like increased pension contributions, that schools are facing. In fact, the full impact of ‘flat cash’ was set out in stark terms in an Education Policy Institute report earlier this year. It is now clear that as costs rise, schools will find themselves with far less cash to spend on pupils. Furthermore, none of this takes into account the slack many schools (particularly in deprived areas), are having to take up, as social and community services are cut back and years of austerity take their toll. It is hard to see how the schools struggling the most will be able to change their fortunes if they are the ones being hit worst by funding cuts. How will the most struggling schools change their fortunes if they’re the ones hit worst by funding cuts? Removing any schools without funding figures, a progress 8 score/band, or with no pupils or budget in 2015/16 (i.e. new schools). I then compared changes in funding across the five bands of P8 performance.